Lincoln is a city in Burleigh County, North Dakota, United States. It is a suburb of Bismarck. 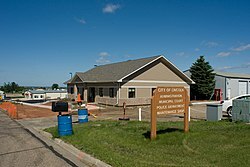 The population was 2,406 at the 2010 census, making it the 15th largest city in North Dakota. Lincoln was founded in 1977. ↑ "2010 Census Redistricting Data (Public Law 94-171) Summary File". American FactFinder. United States Census Bureau. Archived from the original on 21 July 2011. Retrieved 2 May 2011. This page was last changed on 22 November 2018, at 09:45.